Alastair Daired, on the other hand, is color-blind, won’t leave the house with at least two weapons on him, and kills monsters for a living. He is the oldest child and heir to the ancient House Daired, the only dragon-riding family in the Kingdom of Arle. His sworn sister-in-arms is the dragon Ahla-Na-al Kanah-sha’an-Akarra (She-Whose-Wings-Bring-the-Tempest, in the human tongue). She goes by Akarra, and thinks her human takes himself way too seriously. Elle: Riders are the warrior elite of Arle, an occupation usually passed down from parents to children and reserved for the oldest and wealthiest bloodlines. They are the only ones allowed to bond with and ride wyverns, bear-like beoryns or, in the Daireds’ case, dragons. DJ: What is the world or setting of Heartstone? Elle: Heartstone is set in the Kingdom of Arle, an island nation with a startling geographic resemblance to a country Ms. Austen would not find unfamiliar—with one important distinction. Arle has monsters. Non-human creatures collectively called the Oldkind nearly outnumber the people of Arle. Some kinds (dragons, wyverns, beoryns, hobgoblins, etc.) live in harmony with humans and call themselves Shani, or the friends of humankind. Some (centaurs, will-o’-the-wisps, merfolk and the like) don’t care either way and call themselves Idar, the indifferent. And some creatures like direwolves, lamias, gryphons, and banshees hate humans and hunt them for food, or sport, or both. They are called the Tekari, the foes of humans and Shani, and it is these creatures that the Riders are sworn to fight. 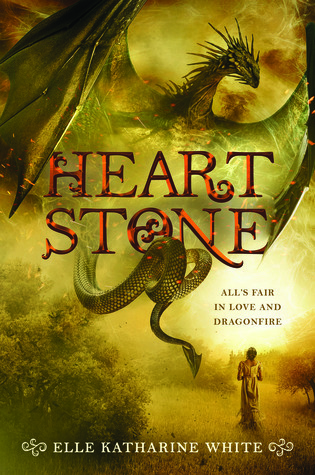 DJ: Heartstone has a gorgeous dragon on the cover, and I’m pretty sure there are also many of fantastical creatures too? DJ: What was your favorite part about writing Heartstone? Elle: Discovering fun ways for Aliza and the other main characters to interact with the non-human creatures. Especially the hobgoblins. I loved writing those little guys. DJ: When I read, I love to collect quotes – whether it be because they’re funny, foodie, or have a personal meaning to me. Do you have any favorite quotes from Heartstone that you can share with us? DJ: Now that Heartstone is released, what is next for you? Elle: Hopefully more adventures in Arle! I’m also working on a series of cyberpunk heist novels filled with technological mayhem, corporate espionage, sibling rivalries, and GIRL POWER. DJ: Before we go, what is that one thing you’d like readers to know about Heartstone that we haven’t talked about yet? Elle: As a bit of an inside joke, I threw in an homage to the 2005 movie adaptation of Pride and Prejudice in a scene toward the end of the book. 100 House points to the first person to find it! Elle was born and raised in Buffalo, NY, where she learned valuable life skills like how to clear a snowy driveway in under twenty minutes (a lot easier than you think) and how to cheer for the perennial underdog (a lot harder than you think)..
Actually, the main reason I wanted to have Elizabeth on was because I wanted to hear about this world. I wasn’t a Pride and Prejudice fan but I love the sound of this book. I’ll add it to my TBR. I like that the Elizabeth in the story has an eavesdropping problem, lol.